Imagine an extravagant castle full of luxurious bathing pools and rooms built for pleasure that was so secret you could only enter via a hidden underground passage tunnelled beneath a lake. This was Indonesia’s Taman Sari about 250 years ago and it was here that the city’s king pin – Sultan Hamengkubuwono the 1st – indulged his seemingly huge sexual appetite, watching his concubines splashing about in the pools before choosing one and retreating into his secret pleasure rooms. Known as the garden of flowers, Taman Sari was the ultimate Eden, an island separated from the rest of Yogyakarta’s much larger royal palace, the Kraton and built entirely for pleasure. There were meditation chambers and water gardens, swimming pools, pavilions and even an underground, water-filled mosque. 250 years have now past and much of Taman Sari has been obliterated by long decades of war and natural disasters. 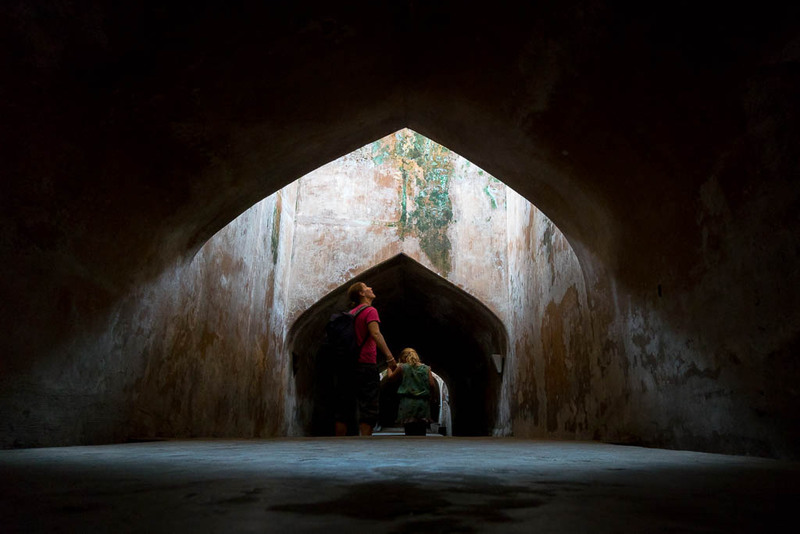 An earthquake in 1867 ruined the complex and drained its lakes and Yogyakarta’s burgeoning population moved in, but what endures is the tunnel that links the Sultan’s elaborate underground mosque to the beautifully restored bathing complex. Getting there is a thrilling game for self-guided visitors (i.e. you will probably get totally lost navigating the confusing maze of dimly lit tunnels and staircases that climb to hilltop ruins before finally emerging at the highly decorated gate of the Sultan’s pools). Had we forked out for a local guide the tour would have been much more straightforward but not the adventure it turned out to be! Archaeologists don’t consider the Sultan’s pools to be the most important part of ancient Taman Sari (most of which is invisible today), but they are an alluring tourist attraction that breathes life into all those sordid yarns about the Sultan’s dirty little secrets. You’ll find Taman Sari about 2km southwest of Yogyakarta’s Royal Palace, the Kraton, and the modest AUD$7 entry fee is good value. Interestingly, the cultural district that has sprung up around the site has become a hotspot for artisans who specialise in Javanese batik and intricately carved skin puppets. It’s while exploring Taman Sari that we met and filmed a wonderfully skilled Javanese puppet maker, patiently chiselling his design into buffalo skin in the wayung kuilt style. UNESCO has listed this form of uniquely Indonesian skin shadow puppetry as a “Masterpiece of Oral and Intangible Heritage of Humanity“ and a World Heritage listing on Taman Sari itself is pending. Another great story from a wonderful trip, you take us places so off the usual beaten track. Where are you off to next ?